Introducing the JHM Performance Carbon Synchros!!! We now offer a 01E Minimal Repair Kit with JHM Performance Carbon Synchros for a MUCH lower price than OEM synchros while providing better performance. NOTE: We have a much lower priced kit that uses our JHM replica shift collar in this section. Fits all 01E transmissions with the EDU (B5 S4), FZY, DSY, FZV, FDP(B5 RS4), FTU, FTG and FZW transmission codes. NOTE: This is a minimal repair kit ONLY to patch up your transmission and just fix the bad 1-2 shift collar and the 1st and 2nd gear syncrhos. 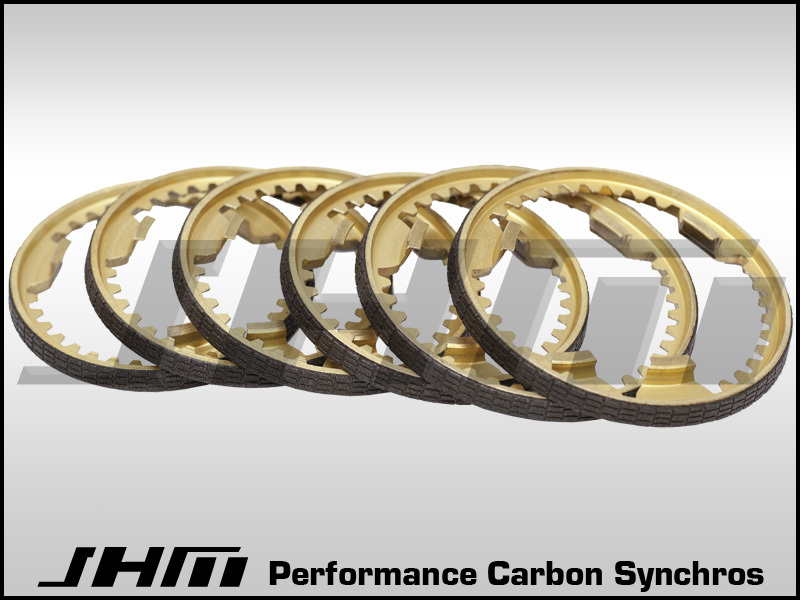 INCLUDES THE FOLLOWING JHM PERFORMANCE CARBON updated 1 and 2 synchronizer rings only (NOTE: Our 1-2 Synchro is a direct replacement for OEM PN 012-311-247-H and only works correctly with the OEM updated 1-2 collar PN 01E-311-239-L for the correct engagement angle. It will NOT work correctly with any other PN 1-2 shift collar.) - OEM synchronizer springs (2) - OEM input shaft seal - OEM case gasket - new OEM updated 1-2 shift collars - inner and outer (note: recently we have been getting both the inner and outer collar from our parts supplier. However, it's possible that we'll may only send the outer collar if our supplier switches back. This won't be an issue as the inner collar never fails, if yours is locked up just press it apart.) This is the part that causes 1st and/or 2nd gear to lock up when it fails. OPTIONS: If you want to at least replace the 3rd and 4th gear synchros as well since they are prone to failure, we sell them individually as well. 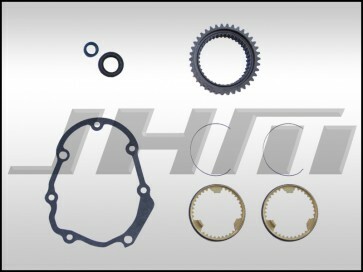 Go back to the "Transmission Parts" section and select the "01E Synchro (JHM-Performance), 3rd-4th-5th-6th Gear - EACH" product. 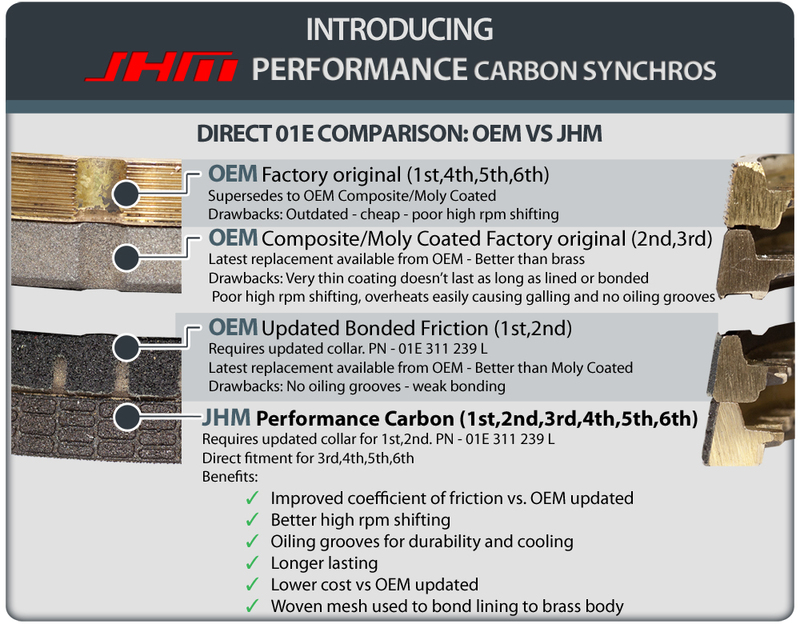 You can then add however many extra JHM Performance Carbon Synchros to your Repair Kit that you want. Replacing these synchros, will decrease your chances later of having to take your transmission apart later for a 3rd or 4th gear synchro. NOTE: This is the MINIMAL kit just to repair 1st and 2nd. It does not come with any other synchros for 3rd, 4th, 5th and 6th, nor does it come with output shaft seals. JH Motorsports does NOT recommend this repair since it is likely you will have to take your transmission apart again for 3rd, 4th, 5th or 6th gear synchros or have to address output shaft seal leaks later. NOTE: These contents have a longer list than this kit but the tools and info are the same.